In 1987 I planned my first voyage into the Sierras. It was just me and my sister's husband Dan who made a tour of the Rock Creek and Crabtree Lakes areas. The trip started at Cottonwood Lakes and ended at Whitney Portal. Along the way I climbed my first two Sierra peaks, one being Hitchcock, the other being Mt. Whitney. Little did I know then, that some twenty-six years and fifty-one summits later, I would be finishing the list of 14,000-foot Sierra peaks. Even more, little did I know I would be doing so alone. And yet, despite the years and changes they have brought, the Sierra's draw is stronger than ever. The Sierra's have kept me young, energized and enthralled with the magnificence of nature. The heat of the sun warming the back of my neck, the give of soft sand under my boots, the cold chill of a snow fed stream stinging at my fingers, the scent of desert sage and brush that first give way to stately pines and gradually disappear as altitude and cold destroy their habitat, the pain of muscles, the pounding rush of blood through my veins, the labor of breathing, astral blue of the day sky contrasted by blackness of the deep night, granite cliffs and towering summits, the silence of thought, the company of others, the grandness of wild space and the simple comforts that can be carried in a backpack; these are just some of the joys to be found in the heights of the great Sierra. Although I have climbed many summits alone, I have never headed into the wilderness by myself. For those readers who have followed my posts over the years, it may seem I have been burning though generations of climbing friends. Sadly, this has come to include those who were tightest in that circle. Therefore, this year I faced the choice of either heading into the mountains without a partner, or finding someone from outside my circle to join me. The choice I made kept me safe and started a new friendship. 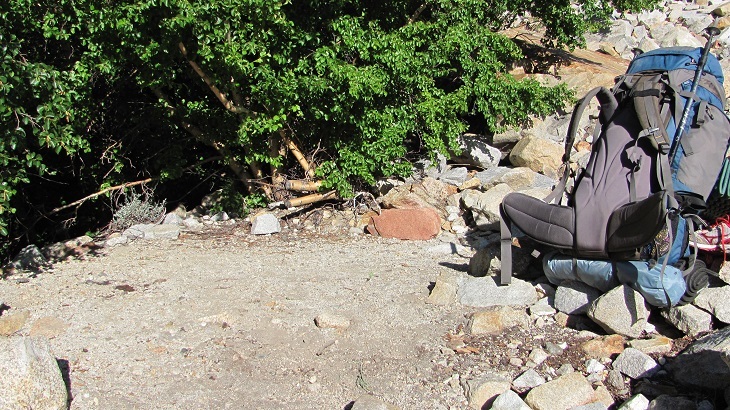 Bob Davey, like me, has spent a great deal of time in California's back-country. To find a fresh Sierra enthusiast at this point in my life is a pleasant surprise. I'm certain, given the opportunity, we'll make a good team in the future. It seemed fitting that our trip up Taboose Creek included many firsts. Neither of us had ventured up this trail before, neither of us had climbed any summits in the area and neither of us had ever climbed with a friend found on the internet. If you love the Sierra, you better at least be able to tolerate the desert. This is especially true of Taboose Creek. It is a desert trail-head. At 5,448 feet, it is the lowest point I've ever started from on the east side. Originally, we had talked about camping Sunday night at the Taboose Creek campground and hitting the trail early on Monday morning. Bob had the idea of starting in on Sunday night and it turned out to be a trip winning choice. I arrived from Vegas in the late afternoon, sorted gear and then taking both cars, we made the slow venture up the Taboose Creek road. We both drove low clearance compact cars and had no trouble with the winding dirt road. You need to pick your way, but it's well graded and not at all steep. At 8:00 pm, we started hiking. There was a light cloud cover moving from the south as we started toward the pass. Our hike led us up the sandy, sage and cactus lined trail, moving past the terminus of a long extinct glacier. 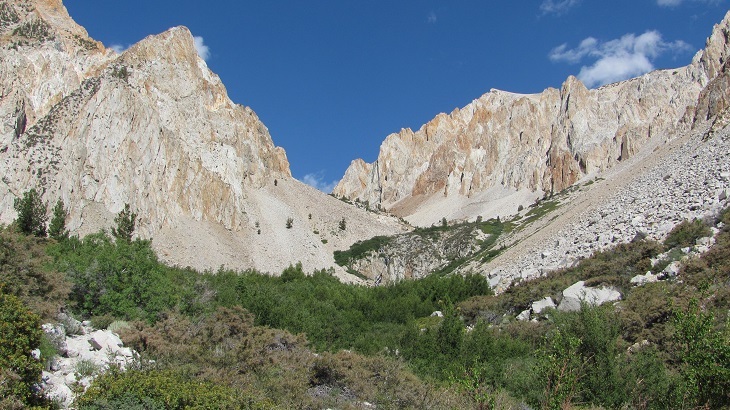 While not as large as other moraines in the Sierra, the Taboose Creek glacier must have been a force to be reckoned with. Its lateral moraines are proud twin ridges of glacial debris, the north-facing ridge standing some two-hundred eighty hundred feet above the desert plain. The trail follows the north side of the creek-bed without fanfare or mercy. Around 9:30, the sky was dark, and the moon provided little aid. We took a break near the stream, collecting water and donning our headlamps. From here on the hike transformed into an eerie mix of dust, faint silhouettes, phantom noise and endless exertion. 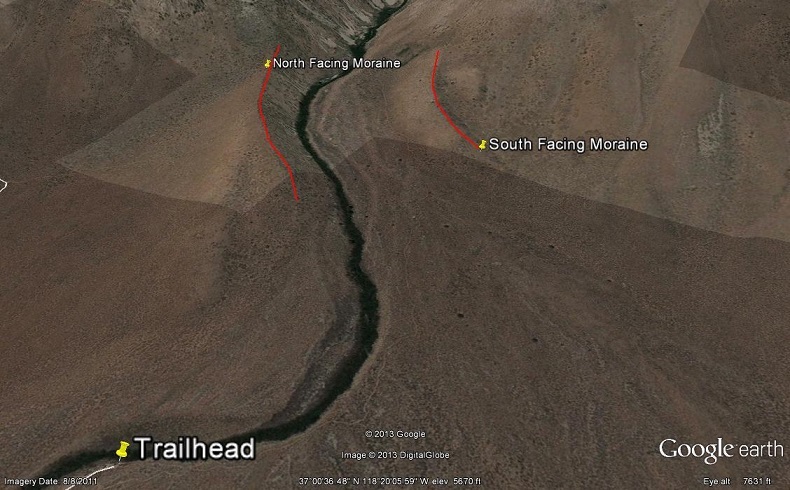 The map shows two streams flowing from the north before one reaches the first proper crossing of Taboose Creek. Both were dry and indistinguishable by the white circles of light emanating from our bobbing headlamps. The evening seemed to take on an endless quality of emptiness. Traveling by headlamp in a dark and unfamiliar wilderness is a starkly unique experience. I recommend it. Around 11:30, we arrived at the first stream crossing. We were beat, but delighted to find we had already climbed to 8,000 feet, out of the desert and into the granite. 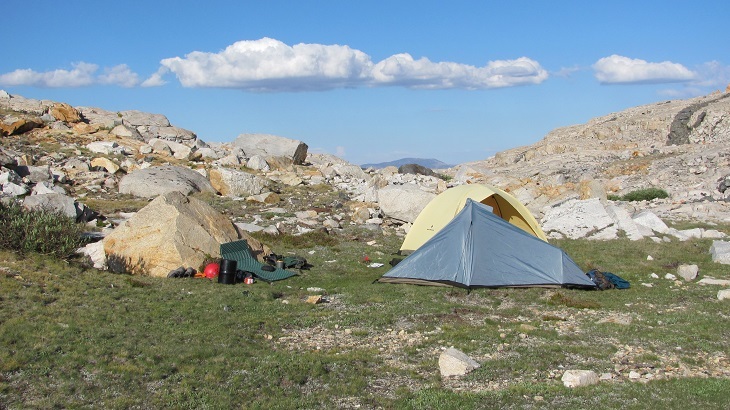 We set up a hasty bivouac camp and after snacks, drinks and chat, retired for a short night's sleep around 12:30. 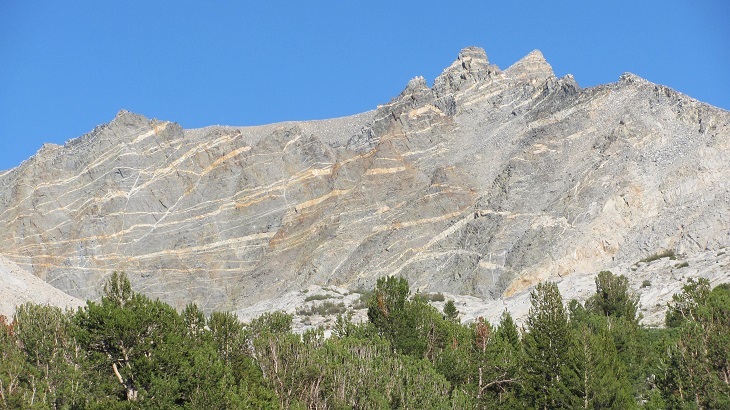 I was wired and excited so before drifting off, I started The Last Season, which is an account of USFS Ranger Randy Morgenstern's disappearance in this very section of the Sierra several years back. I didn't read many pages before my fatigue set in and closed my eyes for seven hours. Bob is an early riser and seems to be a fast guy with his gear. I'm a fastidious coffee drinking, slow packing, technophile. Bob started up the trail around 7:30. By the time I arranged my GPS, music, gear, water and day's food rations I was at least thirty minutes behind. From the first creek crossing the trail stays south of the creek, climbing through pines and brush. Flowers of several kinds were in bloom and I took care to avoid the honeybees patrolling for their sustenance. At around 9,200 feet we crossed the creek at the waterfall, moving back to its north side. This crossing marks a demarcation between the sparse forest and the rugged alpine zone. Our pace was slow, but we were confident that by mid-afternoon, we would arrive at the pass. The trail is rocky but well graded. No easy task, but manageable. By 3:00 pm or so, we had reach the pass and picked a nice camping spot slightly north of the trail. Even though it was a low snow year, the grass was green and the streams were trickling. We made plans for Tuesday and retired early. Tuesday we were up around 7:00 and decided on our route up Cardinal Mountain. Our camp had perfect view of the south chute. We were sure this would be our way down, but felt the rock nose or buttress to the right of the chute would be a more enjoyable climb. The route was pleasant and solid. We found little if any loose rock and picked our way to the summit in a little over three hours. The east face of the summit is a dizzying drop of perhaps a thousand feet or more. After spending around an hour on top we worked our way over to the south chute and scurried our way back to camp. Deep blue skies had set in and we expected a colder night. We made plans for Wednesday's hike up Striped Mountain and again were in bed before darkness set in. We got an earlier start on Wednesday and were moving by just after 8:00. We chose to climb Striped from the Northeast. We picked our way over slabs and talus passing Lake 11,466 on the east side. From there we climbed the east-facing ridge of white rock. The white rock gives way to large flakes of iron rich red slate. At roughly 12,600 feet, you can start working directly south on to a bench on the north side of Stripe's summit. From this point, it's an easy climb up talus to the higher west summit. The air was perfectly clear and calm. It was a great day to hit my 50th Sierra peak. On the way down, we skirted Lake 11,466 on its west side. This was a better choice and saved a fair share of talus hopping. Regardless, it was a long day. We got back to camp around between 4:00 and 5:00. I have to say I was beat at this point. My boots were giving me heel blisters and I'd already climbed about 9,700 feet in the past three days. That didn't put me in happy spirits for Thursday. I had mapped out a route up Split Mountain that I figured would be somewhere around fourteen miles and 5,000 feet of elevation gain. Gulp. My iPhone alarm went off at 05:00. Coffee, final gear check, dressings for my blistered heels and I was off just after 06:00. Bob was unsure how he would fill his day, maybe climb Goodale Mt, maybe move his camp closer to Split so he could try it the next day, or maybe just relax near camp. I had no idea when I would be back, but suggested it would be after dark. 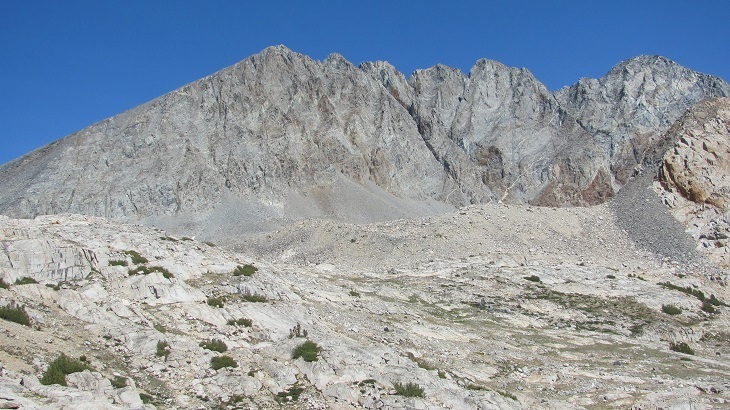 The west side route on Split starts about seven miles from Taboose Pass. The tough part is that even by cutting through the forest south of Cardinal's west ridge, you still have to drop about a thousand feet before meeting up with the John Muir Trail. 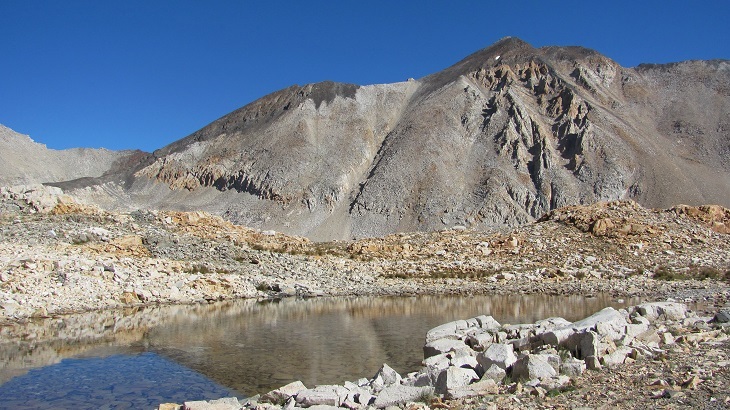 I was only on the JMT for perhaps two miles before heading cross country to the northwest, moving over meadows, slabs and moraine before reaching the base of the west side. "7/18/2013, Mike Bigelow. 7 hrs, 10 minutes from Taboose Pass. 1987 first 14,000 foot summit, today the last. My 14,000 foot Sierra list is done! In 48 hours I'll be back on a plane to Macau via Hong Kong!" The climb down was uneventful, if not slow. I was back at the base of the climb by 3:00 pm and far from excited about the seven-mile hike and final thousand-foot climb back up to Taboose Pass. It was a marathon, grueling day. I kept forcing food and water down and listened to music most of the way. Finally, just before 7:00 pm I hobbled into camp. My heels were raw and my legs sore. I tracked the entire day on my iPhone with the Gaia GPS app and was very impressed. No phone signal, but perfect tracking on a map I downloaded into the phone. It reported 5,578 feet of elevation gain and 16.11 miles. Not off the charts by many standards, but an epic day for me. I was delighted to be back in camp. Bob and I chatted about my day and his plans to stay an extra day. He would spend Friday climbing Goodale and I would make a hasty exit to my car. When I rose at 7:00 Friday morning, Bob was packed and ready to set out on his third peak of the week. We said our goodbyes and thanked each other for a great trip. My feet were a mess and I was not relishing the eight-mile hike down to the trail-head. I bandaged the open sores on my heels and wore sneakers instead of my mountain boots. I set off around 8:15 and made slow progress in the growing heat. Even though gravity is on your side, it's a long walk back to the trail-head. Owens Valley was entering another mini heat wave and by the time I got to my car it was 107 degrees. It took me three hours and forty-five minutes to make the descent. There is no easy way to get to some places in the Sierra. The remoteness of the terrain west of Taboose Pass gives it a special beauty. Upper basin is an amazing flat land of boulder-strewn, polished slabs perched among lush meadows. 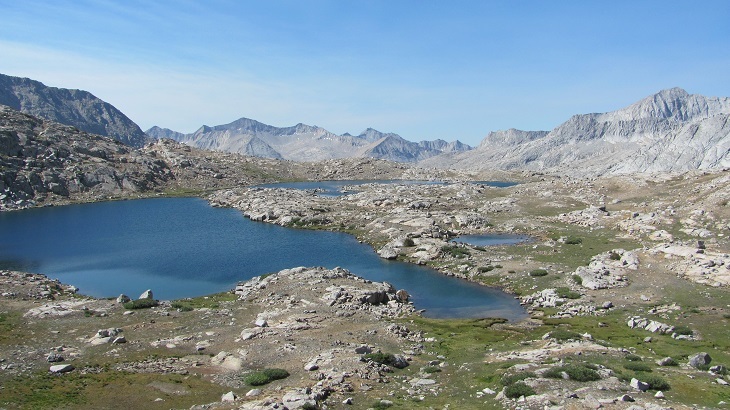 Although the Taboose Pass trail is arduous, it is a unique and direct way to get to an amazing section of the Sierra. I highly recommend starting the trip after sundown and night hike to the first river crossing or even up to below the waterfall. Daytime summer temperatures could make the lower half of this hike unpleasant and more difficult. When you step foot into the wilderness, you never know what you will discover, but you will always come away richer. Thanks' Bob for a great trip! For the rest of you, keep your Sierra dreams alive and get out there and get some dust on those boots! Bob Davey adds: When I arrived at the car midday Saturday, the Owens valley felt like a blast furnace. The heat was so extreme it melted the adhesive on the back of the rear view mirror and it came off in my hand. An evening or super early AM start on this trail, during times of extreme hot weather, will save a lot of misery. You may also want to bring a car cover for your vehicle to protect it from the heat. Great trip Mike!